Mondrian (Pentaho Analysis) is an open source OLAP server which is very popular and can be combined perfectly with JPivot and other XMLA OLAP client. In this section you can find our data and solution samples for Mondrian. Where should I put MySQL jar file ? 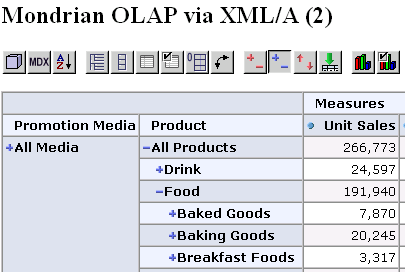 Screenshot of JPivot consumed Mondrian as an XMLA provider which shows 2 dimensional and 3 measures from Foodmart's Sales cube.